A current limitation for plant synthetic biology involves high-throughput screening of genetic parts in plants. Current approaches require testing circuits in individual plants, through transient or stable transgenics. Applying these techniques to entire libraries is not feasible at a laboratory scale. Droplet-based microfluidics has been used to facilitate high throughput analysis of individual prokaryote and mammalian cells. However, there is a scarcity of similar workflows applicable to rapid phenotyping of plant systems. In the first stage of this project, the team aimed to develop a high-throughput screen for the analysis of promoter sequences in plant protoplasts. As a result, they successfully isolated, encapsulated and analysed protoplasts from the model species, Marchantia polymorpha and Arabidopsis thaliana using a PDMS microfluidic device. The team then received a second OpenPlant Fund to to develop microfluidics for both transient and stable protoplast transformation protocols at a high-throughput scale. 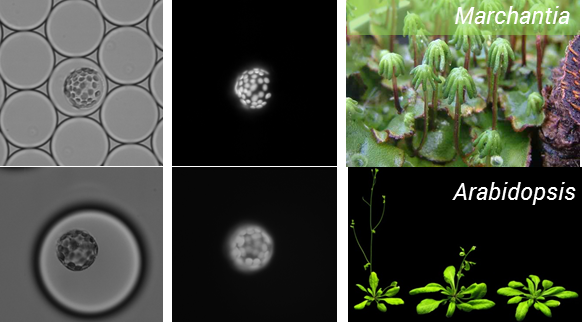 They have now published a preprint (Yu et al., 2017) reporting on-chip encapsulation and analysis of protoplasts isolated from the emergent plant model Marchantia polymorpha at processing rates of >100,000 protoplasts per hour. They used their microfluidic system to quantify the stochastic properties of a heat-inducible promoter across a population of transgenic protoplasts to demonstrate that it has the potential to assess gene expression activity in response to environmental conditions. They further demonstrated on-chip sorting of droplets containing YFP-expressing protoplasts from wild type cells using dielectrophoresis force. This work opens the door to droplet-based microfluidic analysis of plant cells for applications ranging from high-throughput characterisation of DNA parts to single-cell genomics. Yu, Z., Boehm, C. R., Hibberd, J. M., Abell, C., Haseloff, J., Burgess, S. J., & Reyna-Llorens, I. (2017). Droplet-based microfluidic analysis and screening of single plant cells. bioRxiv, 199992.